This image of Ebbets Field, where I saw my first ballgame in 1952, is from a postcard mailed on September 20, 1938, from someone named John to an address in Milwaukee, Wisconsin. John wrote "Notice the Crowd? What a mob. Brooklyn is heading for the cellar." My first game at Ebbets Field was on June 15, 1952. The Reds beat the Dodgers 7-4. Ben Wade started for the Dodgers, relieved by Johnny Rutherford, Billy Loes and Clem Labine. The following are three postcards showing the Polo Grounds in Manhattan. The Polo Grounds was the home of the New York Giants of the National League until 1957. In 1962 and 1963, it was the home of the brand new New York Mets. I saw several Giants games between 1952 and 1957, including games between the Brooklyn Dodgers and the New York Giants. I also saw several New York Mets games there, including their first in New York in April 1962. This card is postmarked August 7, 1936. This card is postmarked September 8, 1939. This card is postmarked May 12, 1955. The following is a vintage postcard of the old Yankee Stadium located at 161st St., and River Ave., in the Bronx. This card was unused and thus not postmarked. 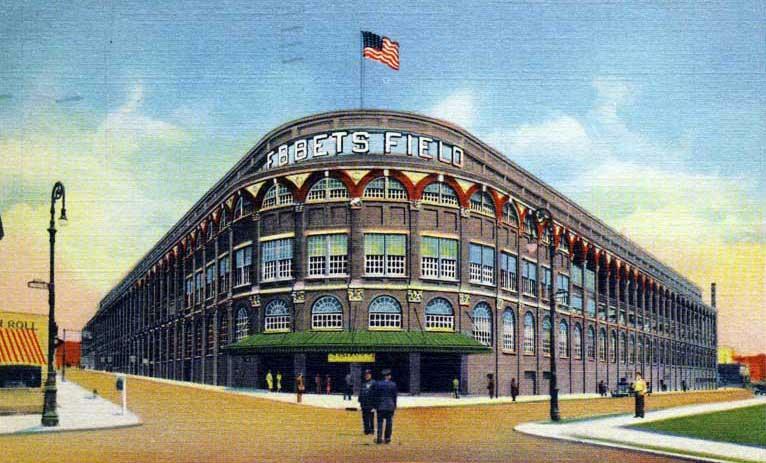 The following is a vintage postcard of Ebbets Field in Brooklyn. One strange thing is that the card shows a green infield. This card was unused and thus not postmarked.